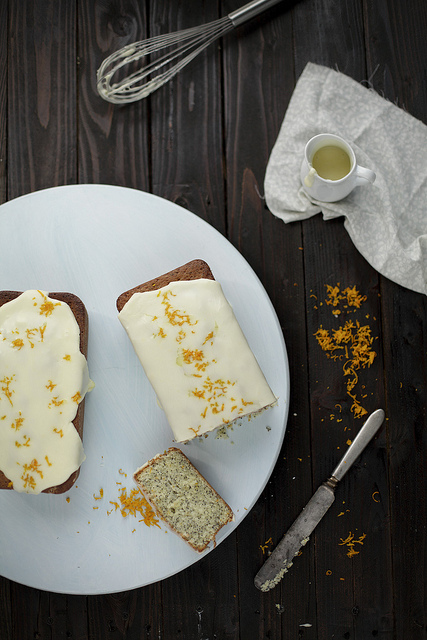 Orange Poppy Seed Loaf Cake — always with butter. Hope everyone had a Merry Christmas and a nice holiday weekend. My Christmas day, and eve, was spent full of baking. I made a loaf of bread, rolls, triple ginger cake squares, walnut crusted pumpkin pie, roasted chestnuts, and two types of vegetable tarts. It was a very busy 24 hours. The counter was overflowed with flour, spices, butter, vegetables falling out of the bowls... The kitchen sink would fill up with bowls, spoons, egg shells; only knowing that that was the sign to start baking something else. And carved the turkey Christmas day! So as you can imagine, not many photos were taken. Definitely not of the pie, which looked an utter mess. The crust recipe was somehow flawed, too much butter I think. Well too much butter if you want it to be pretty to photograph. If you are only looking for a great new twist on pumpkin that tastes quite great, you've found it. I made this loaf cake a few weekends ago, but just hadn't found the time to post it. A really straightforward, pure butter and sugar goodness recipe. 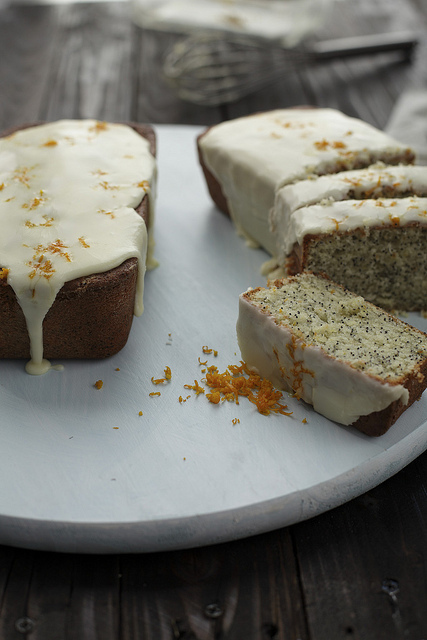 Nothing fancy, orange and poppy seed. The little stick-in-your-teeth poppy seeds just add that wonderful, rich but delicate flavor that is only enhanced by a grand pile of orange zest. Oven 350F. Butter and flour two standard size loaf pans. Beat butter and sugar together until light, about 5 minutes. Add in eggs one at a time then juice, vanilla and zest. It will look curdled, that's fine. Add in the dry mix and poppy seeds until combined. Pour into prepared pans and baked for around 50 minutes or until toothpick comes out clean. Take out of pans after a few minutes and let cool completely on rack. Whisk together sugar and juice for glaze. You want it to be thick but pourable.